Have you ever planned one of those nights with friends that was to be so special, so magical, so memorable that it was sure to go down in the annals of social assemblages? You know, a uniquely themed party that went over so well that you could not wait to share it on, say, a world-wide blog such as this? 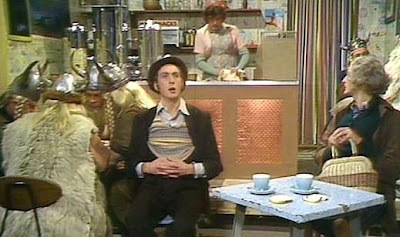 This is a story of old friends, Spam, Marmite, and Monty Python. First and foremost, it's a story of old friends – some of which have known each other for nearly a quarter of a century (more on that later). 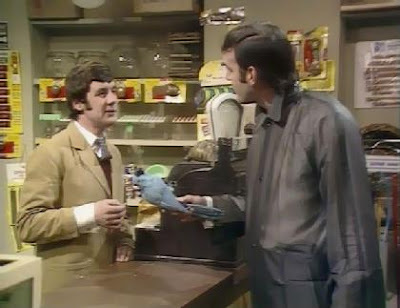 For nearly as long as we've known each other, a few Python fans in the group have been suggesting a Monty Python Flying Circus night. It took a few years – over two decades – but we finally got around to having one. Last night, armed with Spam and a stack of Monty Python DVDs, Lady Suzanne and I invaded Kim and Larry K's home on the north side of Evansville. Joining or merry band were Mike and Debbie V; Mark and Ann T; Dave and Ellen C, unfortunately couldn't make it. (Note: Pictures are being withheld at this time to protect the innocent). Other dishes from guests included shrimp scones, and English cheddar with tart apples. We also introduced the group to Marmite from England. This stuff is a sticky, dark brown paste with a distinctive, powerful flavor (more like chewing on a salt block if you ask me). Like the British company's marketing slogan says: "Love it or hate it." We found that 6 out of 8 couldn't spit it out fast enough; however, Larry and Mark went back for seconds. Yes, Monty Python's Holy Grail Ale (Black Sheep Brewery, New York). After our fill of delicious fare (“delicious” being a relative term) we headed off to watch a few episodes of Monty Python's Flying Circus. Mike V and I, the two instigators of this evening, couldn't wait to introduce the rest of the group to the hilariously funny Flying Circus sketches. We practically had our finger on the remote's “pause button" fully expecting to momentarily pause action to wait for the group to pick themselves off the floor, wipe the tears of laughter out of their eyes, and compose themselves before moving on to the next side-splitting gag. What really followed was a couple of painfully quiet hours, sprinkled with only a few giggles. and Spam sketches couldn't save us! Soon (not soon enough for some, I'm sure) it was time to depart the world of absurdity and back into reality. “So, same time next week?” I offered. Groans. Nevertheless (I don't know if that's the right introductory word, but I've always wanted to start a sentence with it), there is something bigger than Spam going on here. I mentioned early on in this disquisition (yes, I own a thesaurus), that this group has been together on-and-off for over twenty years. We've seen births of our children (well, not seen the actual births, but you know what I mean) and those children grow up into adults. We've waved good-bye to friends who have moved away. We've supported each other through the trials and tribulations of parenthood – not an easy task. We've congratulated each other on successes, hugged each other in difficult times, and cried with each other at the passing of loved ones. Old friends, as a Harry Chapin songs goes, mean so much because they see where we are and know where we've been. Old friends are rare and valuable. Like Marmite, we don't always have the same taste (in food, movies, opinions...), but we'll always be there for each other. And hopefully someday, someday when we're all sitting in our rocking chairs at the Happy Valley (yes, pun intended Larry and Kim) Retirement Home, one of us will say in a shaky, old person voice, “Remember that time we watched Monty Python and ate Spam?” and we'll have a good laugh about it. You just "Nailed Me Head to the Floor!"..Dimsdale. This City Twit loves Silly Walks in the English Countryside and SPAM! By the way, you all must check out the revised KMSA Feast Days Calendar, because, being bored and waiting for jobs to come in the other day, I took it upon myself to add some historic dates important in English-American history, English Bank Holidays and yes...the Official Flying Circus Feast, held on the day that their first episode aired on the BBC. That date is October 5th, which falls on a Tuesday this year. Is Vic there?. priceless. best album i ever bought... makes me laugh even today as i can remember it all word for word....LOL..
as we gather together for meals and movies and sharing stories of our children who are getting married, and buying houses, and being responsible adults...much as we re-learn how to play and have fun with our friends! I wish Sir Lance could have joined us last night -- we always enjoyed Monty Python -- and who doesn't love SPAM, spam and more spam?! Lady S, I too wish I could have been there. But alas, I was busy practicing my self defense against people who attack with fresh fruit. 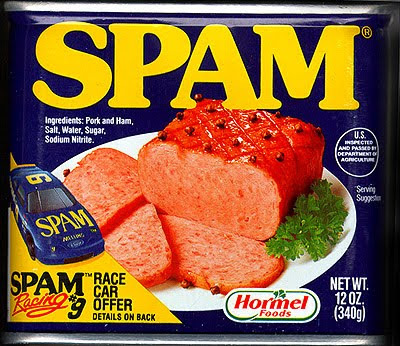 Just remember to throw the Spam out if it starts smelling good after a few days.